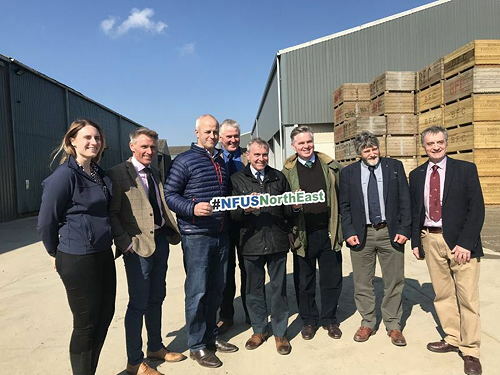 NFU Scotland continued to press the agricultural industry’s priorities for Brexit at a meeting on an Aberdeenshire farm on Friday 5 April with new Minister for Agriculture, Fisheries and Food, Robert Goodwill MP. Mr Goodwill, who took over the role recently following the resignation of George Eustice, toured two farms in Aberdeenshire with NFU Scotland Vice Presidents Martin Kennedy and Charlie Adam and North East Regional Chairman Davie Winton, alongside Director of Policy Jonnie Hall and Political Affairs Manager Clare Slipper. The meeting was also attended by Gordon MP Colin Clark, and Banff and Buchan MP David Duguid. Within his role at Defra, the Minister is taking on responsibility for a wide range of issues impacting Scottish farmers and crofters – notably the UK Government’s Agriculture Bill, and scenario-planning for various possible Brexit outcomes. The meeting was facilitated by Richard Stephen at the arable Muirton of Barra unit, followed by a tour of the robotic milking facility at the nearby Mackies Farm. The meeting followed on from recent intensive engagement with politicians and key decision-makers at Westminster as the Brexit uncertainty continues. During the meeting, NFU Scotland reiterated the importance of the UK Government finding a deal with the EU that ensures continued free and frictionless trade with the EU. NFUS highlighted that the ongoing uncertainty of the Brexit process has been hugely damaging to business confidence and it is vital the UK Government and MPs consider the needs of business in getting a Withdrawal Agreement over the line. NFU Scotland officials also warned the Minister that the import tariff schedule the UK Government has put on the table in the event of a ‘no deal’ does not provide fair protection across the agricultural sectors from market failure – urging a rethink. The Union pressed for urgent and accelerated engagement from UK Government on what it is the whole agricultural sector will require if there is to be a ‘no deal’ Brexit outcome in terms of preventing market failure in the first instance and mitigating the impact for the different agricultural sectors in the event of market upheaval. On the UK Agriculture Bill, the Minister was pressed on clarification of the process and progress of this legislation. In order that the internal UK market is not compromised, certain elements contained within the UK Agriculture Bill must not be allowed to disadvantage or side-line Scottish interests. As a consequence, NFU Scotland continues to focus effort on Westminster so the interests of all of Scotland’s farmers and crofters, and the food and drink sectors they underpin, are both safeguarded and enhanced. The engagement with the new Defra Minister provided a further opportunity to press the Union’s case on future funding of agricultural policy, prioritising food production, and standards and international trade. “Within weeks of Mr Goodwill coming into post, we have managed to get him onto farms in Scotland to discuss directly with us the key issues affecting farmers and crofters and the impact Brexit could have on them. “NFU Scotland enjoyed a very good working relationship with Mr Goodwill’s predecessor in this post, George Eustice, over five years. We are pleased to have built on that constructive dialogue in our initial discussions with the newly-appointed Minister. “This meeting follows months and years of intensive lobbying by NFU Scotland since the referendum to the UK Government to ensure that Brexit ensures a bright future for Scottish farmers and crofters. That means continued free and frictionless trade with the EU; the protection of domestic production standards; access to EU and non-EU workers; and a fresh, new agricultural policy that is genuinely fitted to the profile of Scottish agriculture.